Overview - The continued adventures of the four adolescent mutated turtles gifted in the art of the ninja, as they attempt to stop a mysterious evil that threatens to end the world. It all started as a joke. Comic artist Kevin Eastman wanted to parody industry favorites like "Daredevil," "The New Mutants," "Cerebus," and "Ronin," so he drummed up some money and self-published a single issue release of the tongue-in-cheek "Teenage Mutant Ninja Turtles" in 1984. Almost overnight, his creation gave birth to an animated television series, a line of toys and a comic series. By the time the television series had run its course in the early '90s, an entire generation of kids had taken Eastman's joke very seriously. And even twenty years after the fact, the turtles have yet to fall by the way side. In the years since their debut, there have been a successful series of live action films, new action figures released on a regular basis, and even a recent TV reboot. The latest offshoot of this profitable juggernaut came in the form of 'TMNT,' a feature length CG animated film helmed by rookie writer/director Kevin Munroe. The story picks up after the events of the second live action film -- the evil Shredder is dead and the turtles have drifted apart. Their rodent sensei, Splinter (Mako Iwamatsu), is content on keeping them hidden in the sewers while their leader, Leonardo (James Arnold Taylor), has disappeared for extensive training in South America. The remaining ninja include the intellectual Donatello (Mitchell Whitfield), the laid-back Michelangelo (Mikey Kelley), and the angst-ridden Raphael (Nolan North) -- all of whom long to get back to the streets to fight crime once again. But a new threat begins to emerge -- a wealthy businessman named Max Winters (Patrick Stewart) is employing the ex-captain of Shredder's foot soldiers (Zhang Ziyi) to track down dangerous beasts that have begun to appear in the city. He's also resurrected four generals from an ancient era to gather the beasts for his own purposes. With the help of reporter April O'Neil (Sarah Michelle Gellar) and vigilante Casey Jones (Chris Evans), the turtles must put aside their differences and combat the mounting evil in New York City. I have to warn you -- I left a lot of plot details out of this summary and yet it still sounds convoluted. Anyone who hasn't followed the "Teenage Mutant Ninja Turtle" cartoons or live action films will likely be lost through much of the first act of the film. At only 87 minutes, the filmmakers bizarrely try to cram as much as they can into the story, assuming that everyone understands what's going on. An additional fifteen or twenty minutes could have gone a long way to making 'TMNT' a better film that is more accessible to new audiences. Even fans of the franchise may have a have a hard time with the film -- especially in its early stages, as 'TMNT' introduces a plethora of new character developments that seem to come out of nowhere. Somehow though, things manage to pull together in the second act and a decent film finds it onto the screen. Granted, there are plenty of moments that could have been fleshed out, but the characterizations and internal conflicts work well in spite of the fact that I constantly felt as if I was playing catch-up. 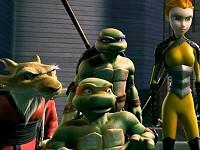 But the main thing that saves 'TMNT' from simply being average is the animation. The CG visuals are gorgeous and add a welcome level of realism to the proceedings -- somewhat surprisingly, the film never feels cartoony, even though the stylized character designs clearly draw the majority of their inspiration from the animated TV series. 'TMNT' is a dark film with lots of violence that may scare some younger children, but it really sells the danger and ferocity of the fight scenes. That being said, CG isn't the only thing that makes the turtles special in this latest outing. For the first time in the history of the franchise, the turtles actually move like ninjas. They're not clumsy men in turtle suits or choppy drawings with little fighting prowess -- they're swift instruments of death, striking fast and hard. As such, the film certainly pushes the boundaries of its PG rating and very much felt like a PG-13 flick to me. 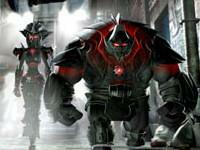 In the end, 'TMNT' is a decent flick that sails through on superb animation and exciting action scenes. I still wish the filmmakers took a but more time to flesh out the story and the characters, but I was entertained nonetheless. Newcomers and old fans alike will find plenty to love in this often mind-numbing but always visually-stunning film. 'TMNT' arrives on both high-def formats with identical 1080p/VC-1 encodes that do an excellent job of showcasing the film's CG animation. From the very beginning, a lush color palette and an exquisite level of detail are on full display. I wasn't expecting the animators to pack so many textures onto the screen, but this transfer renders them perfectly. The turtles' skin, Splinter's fur, and even the cracks in their shells are crisp and sharp. Furthermore, environmental details add depth to the picture and populate the screen with grime that gives the city a realistic quality that enhances the imagery. Want your jaw to drop? 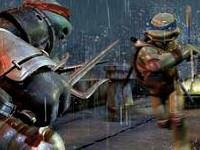 Skip to the scene where Leo fights Raph atop a neon-lit building in the rain -- note the droplets of water as they splash on the turtles and cascade to the ground. Even better, black levels and contrast are dead on (as they are throughout the film) and the flicker of the lights make this one of the most impressive high-def scenes I've had the pleasure of watching. The entire image is much darker than one might expect from an animated film, but it provides the picture with dimension that crafts a considerable illusion of depth. The only technical downside to the transfer is that there are several instances of color banding -- most noticeably in nighttime scenes when large expanses of the sky are visible overtop the city. This "stair-stepped" effect seems to haunt most animated movies I've watched in high-def and is a subtle distraction in an otherwise top notch visual presentation. As you would expect, the transfer is grain free and I didn't catch any instances of other noise or artifacting. Compared to the standard DVD, this HD DVD transfer offers a significant upgrade in color saturation and detail that comes very close to making 'TMNT' a reference level animated high-def release. Like the video, the main audio track on both the HD DVD and Blu-ray releases is identical -- both discs feature a rich Dolby TrueHD 5.1 audio mix that pushes most scenes to their limit. The track's dynamics are the first thing I noticed and it's clear that the sound designers have produced a mix with unwavering highs and rumbling lows. Dialogue is well-prioritized in the soundscape, and effects produce convincing impacts across the channels. To the mix's great credit, the rear speakers get quite lively throughout the film and inject a healthy dose of ambiance and street noise into the soundfield. Channel movement is swift and natural, accuracy is on point, and the score has a subtle interplay with the rest of the soundscape. The mystical elements in the film are accompanied by an immersive hum in the soundfield that gives the villains a hefty presence. This sort of mood-switching in the mix adds to the tone of the film, but it also demonstrates the power of a TrueHD track that's backed up by proper sound design. Sword clangs and staff strikes hit the ear naturally, without resorting to artificially peaking the effects. Likewise, the smash and crash of breaking environmental elements is delivered across multiple channels to provide the mix with power -- an appreciated alternative to some mixes that simply increase an effect's volume to trick listeners into hearing more "oomph" in a sound. The only issue I had was minor -- like most animated films, the quality of the sound effects in 'TMNT' can sound a bit stagey at times. Some may defend the track since it's essentially built for a cartoon, but every other element of the film had a distinct realism despite the stylized animation. As such, I found these occasional cartoony sound effects out of place. It's a small complaint to be sure (and probably isn't a technical issue with the mix), but one that distracted me frequently enough to mention it. Both high-def releases of 'TMNT' include all of the special features available on the concurrently-released standard-def DVD. Alas, this one's a fairly slim package. First up is an overly technical commentary with writer/director Kevin Munroe that, quite frankly, bored me to no end. Considering the pop-culture status of the original cartoon, Munroe spends virtually no time talking about the origins of the turtles or the genesis of this new CG take on an old favorite. Instead, he spends the majority of the track discussing the ins and outs of the animation process. More distressingly, he seems proud of the cuts to the film's length instead of recognizing the problems this caused for the clarity of the plot. An "Alternate Opening and Ending" (4 minutes) features Splinter explaining the origin of the turtles (rather than the final voiceover provided by Lawrence Fishburne) and an uneventful ending that includes Casey Jones and April O'Neil. Neither scene variation offers anything of substance to the film, and both are presented in pre-viz form rather than in finalized animation. A "Deleted Scene" (1 minute) is actually a scene extension where Michelangelo sneaks a piece of cake for Splinter. It's an arbitrary scene, but shows the progress of the animation through several stages. Likewise, a group of "Side-by-Side Comparisons of Storyboards and CGI Action" (5 minutes) include a few scene extensions that were trimmed due to story flow. Munroe provides a running commentary of what we're seeing, but this is a fairly standard look at early ideas compared to finalized animation. "Donny's Digital Data Files" (2 minutes), on the other hand, is a featurette with a lot of potential. Although it ultimately proves too short to make an impact, it details the creation of the CG turtle models and the numerous layers and anatomical nuances in each character. This is one of the few extras worth watching -- I just wish it were much longer. "TMNT Voice Talent First Look" (5 minutes) is a brief collection of interviews with Patrick Stewart, Laurence Fishburne, Sarah Michelle Gellar, Munroe, and other cast and crew members. Unfortunately, this is purely a commercial endeavor meant to sell you on a film you're already watching. I've seen this sort of featurette a million times before and it doesn't bring anything significant to the supplemental package. Finally, a version of the film's trailer that was released online is included on the disc -- but alas there's no sign of the actual theatrical trailer. While 'TMNT' may be convoluted and nonsensical at times, it has some of the finest animated fight scenes and CG animation I've seen in a long time. Likewise, this HD DVD release is a technical wonder with an excellent video transfer and an impressive Dolby TrueHD audio mix. The only thing that drags the overall grade down is underwhelming supplements package. Still, this one's an easy recommend for fans of the franchise.